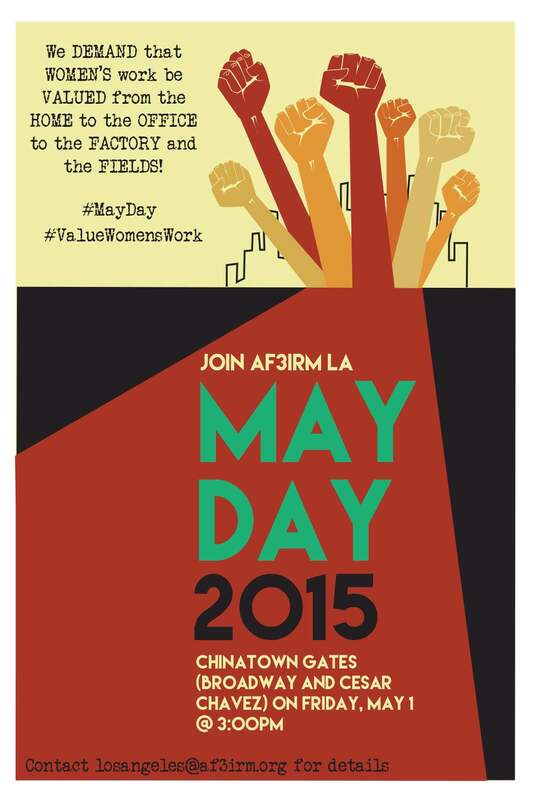 LOS ANGELES–On Friday, May 1st, 2015, the women of AF3IRM Los Angeles join workers and their allies on the streets to commemorate International Worker’s Day and to continue the struggle for economic and labor justice! This past March 8th, we made history as we convened a march and rally with the Ovarian Psyco-Cycles and over 80 endorsing organizations on International Women’s Day, calling for the end of the genocide against womankind. This May Day, we build upon the beautiful energy we felt vibrating through the streets of downtown Los Angeles and we call on all of our sisters to join our Women’s Contingent. March alongside us as we demand dignity for women workers here and around the globe! As transnational, anti-imperialist women of color, we cannot afford to stay silent! We know that now, more than ever, we must fight for an end to unjust labor practices and economic policies that rely on the exploitation of women’s labor, especially im/migrant women. We call for a women’s contingent to denounce the capitalist system that keeps women of color out of and at the bottom of the workforce and that stays silent as women are abused and sexually harassed on the job. For transnational women workers, we must fight for dignified work conditions that are free from health hazards and free from the threat of physical, verbal, and sexual abuse. We condemn the systems that underpay, and most often do not pay, the labor that women of color provide to care for, support, and heal their families and communities. We demand better policies around family and sick leave. We call attention to the immense value of this labor, which should not only be considered the work of caring, but also the work of resistance, especially in the face of the violences of police brutality, imperial war, militarization, and environmental destruction. We call for an end to the exploitation and deportation of migrant women workers and an end to the criminalization of transnational women on a basis of citizenship. We demand the reversal of the free trade policies that have been structuring the dangerous conditions of migration for decades. We are inspired by the movements and the struggles for a living wage across the country and across the world, in particular the strong Fight For $15 campaign here in Los Angeles. Though the struggle must continue, we salute the workers all over the world who have been struggling and striking this year, such as the garment workers in Cambodia – 90% of them women – fighting for better pay and working conditions; United Steelworkers who, supported by the movement against the fossil fuel industry, demanded safer conditions at oil refineries across the nation; and the thousands of strikers and supporters in Baja, California who temporarily closed highways and stopped agricultural production, risking arrest and their livelihoods in protest against exploitative working conditions, low pay, sexual abuse and child labor. We send our support to the garment workers who are continuing to fight for their rights and build an organized labor movement in the aftermath of the 2013 Rana Plaza massacre in Bangladesh. We march in solidarity with all of the working women around the world. Because women workers make up two- thirds of the working poor, because the second (or even third!) shift is undervalued, because women are on the front lines of economic justice, women must be on the front lines of the struggle for justice! Join us on Friday, May 1st, as we demand that women’s work be valued from the home to the office to the factory and the fields! Our Women’s Contingent will gather at the Chinatown Gates at 3pm (Broadway and Cesar Chavez – look for the purple signs!) Contact [email protected] for all inquiries. Previous PostAF3IRM: Women’s Work Sustains Human Existence – This May Day, Support the True Value of Women’s Work!Next PostNo More Business as Usual!!! End Corporatism’s Global Oppression and Exploitation!